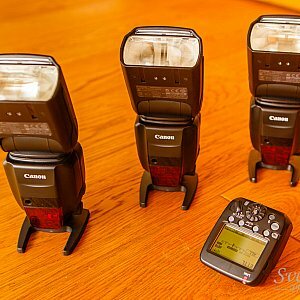 Some months ago Canon released it's new flagship speedlite, the 600EX-RT and the wireless transmitter ST-E3-RT. Featuring a new wireless control system I was in need to get my hands on them. 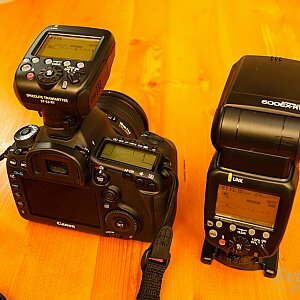 Of cause just a transmitter and one flash unit does not make that much sense. So I've got me three 600EX-RT and replaced my older 580EXII. Let's skip the talk about build quality. 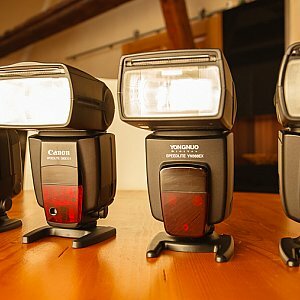 It's a flagship speedlite and that's exactly how it's build. 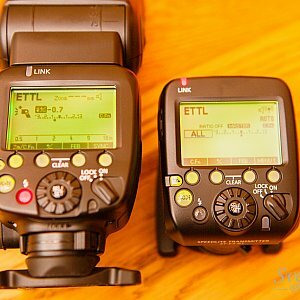 Of cause the main feature of the new 600EX-RT is the ability to control slaves wireless. Besides the well known optical Master/Slave mode there is a new radio based control system build in. 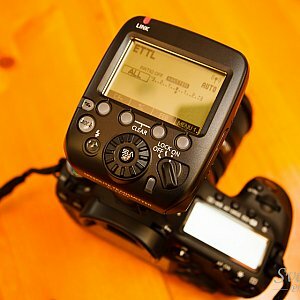 A 600EX-RT can act as a master unit as well as a slave unit. Keep in mind that there is a 600EX model out there which lacks the ability to use the radio control feature. I accidentally got one of those and for me those units are a waste of money. Another feature which is quite nice it the extended zoom range. Where the 580EXII featured a range of 24-105mm the 600EX gives you a range of 20-200mm. 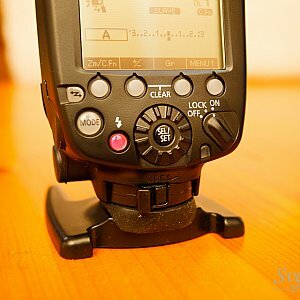 If you use the zoom as a build in light modifier this becomes useful from time to time. While speaking of the flash head I should mention the new gel holder. 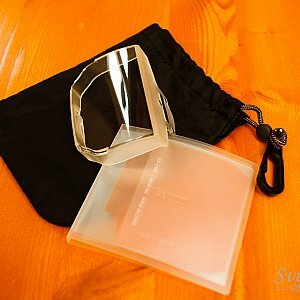 It's a piece of plastic which you can put in front of the head and add a gel to it. 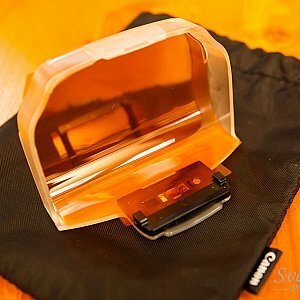 Canon delivers a small bag for the gel holder and two different gels: a 1/4 CTO and a full CTO. I think that is a bit weak. I love the 1/2 CTO and it would not cost them a fortune to add some additional gels. Actually the tiny map which they deliver to hold the gels has some empty space. Nevertheless in theory you don't need to use your Velcro attached gels again. But since they lack of providing the 1/2 CTO I still attach my Honl gels. The user interface is all new too. You can access options with dedicated buttons below the display like Metz is doing this since ages. The display is now a graphical display with a dot matrix. Switching to the wireless mode can be done using a dedicated button as well. 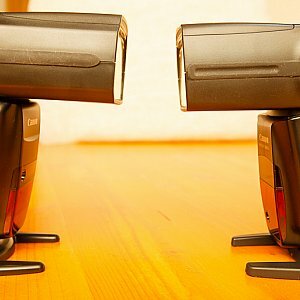 For me the new interface was the reason to give away my 580EXII and the 430EXII because I don't want to mess around with two different ways to control my speedlites. And hey, the display can be illuminated in green or orange now ;-) In the end the new way of controlling the flash makes it not longer necessary to use the cameras control menu to get what you want. The mini stand... well, yes there is one. But if you have to spend more than 500€ for the flash unit I think they should be able to put a mini stand with a metal screw thread in the box. Just like with the gels this is just a tiny thing which would make customers more happy. It beeps! Yes! Finally Canon made the flash telling you when it's ready to fire again. Especially if you used the 580EXII before you'll notice that you have to wait a little bit longer until the flash is ready again. Enabling the sound feature will prevent you from firing to soon. If you shoot using radio you can make the master unit beep if all attached slaves are ready. If you just use the optical wireless mode you'll not notice anything new. You have three groups which you can control from the master unit. That's about it. If you switch to the radio based wireless control mode nothing changes here. Three groups to control in eTTL, Multi and Manual mode. 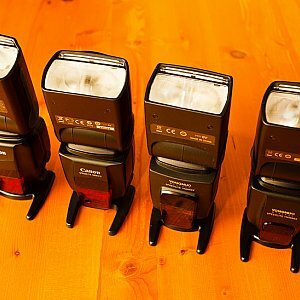 But attached to the right camera you'll get a fourth flash model: Group! This brings you five groups which can be controlled separately. The great thing about this is that you can mix the flash modes of those groups. You can set group A to eTTL while group D and group E fire in Manual mode. There are a lot of configuration options to select the right channel and ID to prevent interference with other shooters and select the best frequency which is available. Where the optical system was not limited in the number of slave units you can attached the radio based system is. 15 unit is the limit which includes transmitters and receivers. But that's a number I can live with. 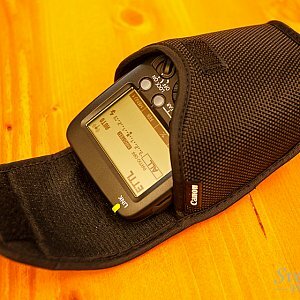 The wireless system is not only able to control remote flashes. 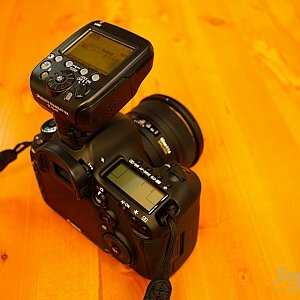 You can also trigger your camera remotely. 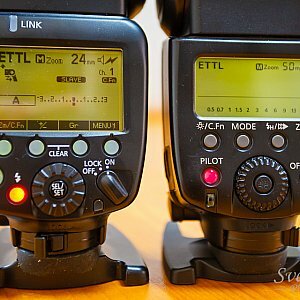 For newer cameras like the 5DMKIII just attach the 600EX-RT or the ST-E3-ST to you camera and you can simply trigger the camera. 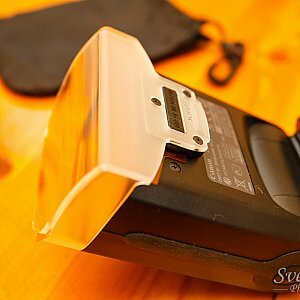 For older cameras you'll need an additional remote control cable to connect the receiver to the camera. Just to mention this again, the master unit can give you a short beep if all slaves are ready to fire. A tiny LED at the transmitter and receiver gives you information about the connection status so you'll easily see if you move your camera too far away from the slave units. If you're using the unit on the camera just for controlling other units it would be a wast of money to put a 600EX-RT in the hot shoe. Instead you can use the ST-E3-RT. 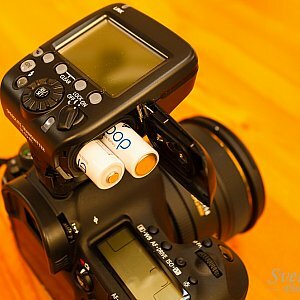 That's a wireless controller for radio only so it'll not work with your 580EXII or similar speedlites. 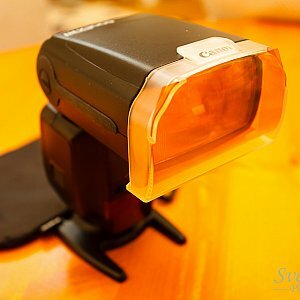 It's basically a 600EX-RT without a flash head. The display and the controls are exactly the same. The only thing I don't like about it is the lack of an auto focus assist light. It's totally unclear why they did not just add this to the unit. Saving money can't be the reason since the transmitter is priced at 300€. 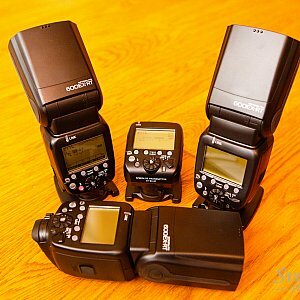 For that money I can get a bunch of YN-622 which all have auto focus assist. Anyway, if you want to just control your 600EX-RT from the camera consider buying the ST-E3-RT. I used the 580EXII for several years. It was fast and reliable. For me the 600EX is a bit slower but as reliable as the 580EXII. The controls are a huge improvement. It's a little bit bigger than it's predecessor. That's it for the differences. 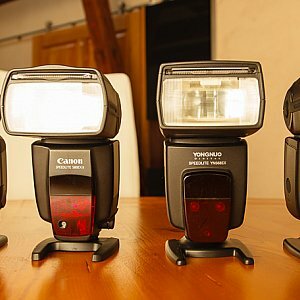 Please find below some images which compare a range of speedlites like the YN-565EX and the YN-568EX against the new Canon 600EX-RT. Should you buy it? Depends. It does not offer more light for your money. It's even slower in some situations. But it features the new control system, the radio based wireless mode and the beep. For me the new wireless modes saves me from bringing extra wireless controllers and extra batteries to the set. It's just very convenient to get everything out of the box. The new gel holder is a nice idea but so far I still use my velcro straps. 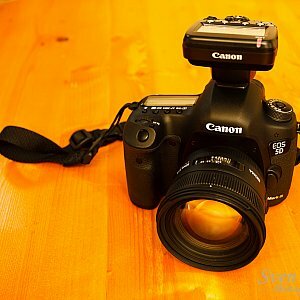 The main issue is the camera you're using. 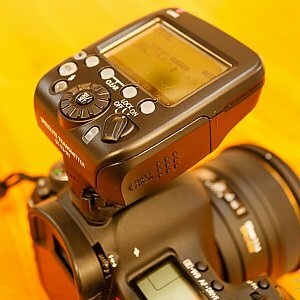 On a 5DMKII you can't use the new Group mode. In addition the sync speed drops down to 1/125s in wireless mode. Everything is fine with a 5DMKIII or the 1D-X. The new 70D should be fine too. 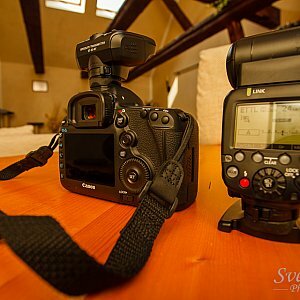 The new 600EX-RT and the ST-E3-RT are great tools to use with newer Canon cameras. They are new toys and I love them. 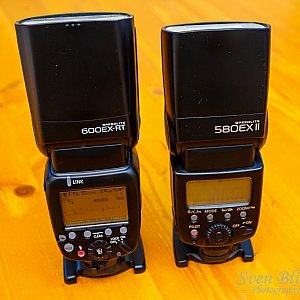 If you buy a new flash today, I recommend not going for a 580EXII anymore. Get the 600EX-RT any you'll be future proof. What do you think? Just leave your opinion in the comment section. 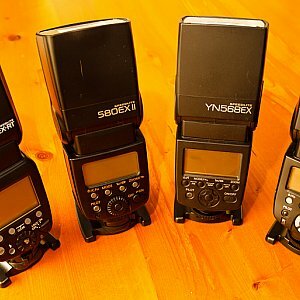 Not sure if the guys from Yongnuo read this article but they recently presented the new YN-E3-RT together with a YN-600EX-RT. 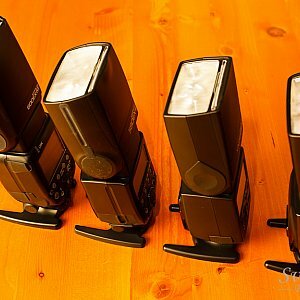 While the speedlite YN-600EX-RT might be just a clone of the Canon 600EX-RT the YN-E3-RT is interesting. It features the auto focus assist light which I missed so much. Until now there is no release date for those two units but you can be sure that you'll read a review of the YN-E3-RT on this site as soon as it's available.